Biography of Irish Landscape Artist, Figure Painter. The figurative and rural landscape artist Stanhope Forbes, later an important member of the influential Newlyn school of landscape painting, was born in Dublin to an English father and French mother. An uncle, the art-collector James Staats Forbes, had a well known collection of contemporary paintings. Stanhope studied fine art painting at Dulwich College, the Lambeth School of Art, then briefly at the Royal Academy Schools. In London he made friends with Henry La Thangue with whom he painted later in Brittany. After London, Forbes studied figurative drawing and painting in Paris under Leon Bonnat at his art studio in Clichy. In 1881, he went to St. Malo in Brittany to practise Impressionist-style landscape painting. 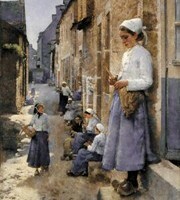 here he executed "A Street in Brittany" which met with considerable success when it was shown at the Royal Academy in 1882. It was purchased by the Walker Art Gallery in Liverpool which gave Forbes enormous encouragement in his plein-air painting career. He returned to Brittany in 1883 staying at Pont-Aven and Quimperle. Without doubt he would have met several other Irish artists who were painting there at the time, like: Nathaniel Hill, Walter Osborne, Norman Garstin, and Joseph Malachy Kavanagh. At the Royal Hibernian Academy the following year, he exhibited "Breton Children in an Orchard - Quimperle" a picture with obvious similarities to Walter Osborne's "Apple Gathering, Quimperlé, Brittany", shown at the same exhibition. His Breton paintings - like, "Preparations for the Market, Quimperlé" and "Fair Measures: a shop in Quimperle" were also successfully shown at the Royal Academy. In 1884, at the age of 27, he moved to Newlyn in Cornwall where he settled for the rest of his life. He became one of the central figures of the Newlyn School, which - because of his many successes at the Royal Academy - soon became firmly established. Here he met fellow painter Elizabeth Adela Armstrong (1859-1912) whom he later married. Of his fine art, Norman Garstin wrote: "[Forbes] sees with extraordinary clearness and simplicity, and renders with extraordinary clearness what he sees". In 1886 Stanhope Forbes became a founding member of the New English Art Club. He was elected a Royal Academician in 1910 and continued painting with distinction for the rest of his life.  For details of other figurative landscape painters, see: Irish Artists: Paintings and Biographies.  For more about figurative artists in Ireland like Stanhope Forbes, see: Irish Art Guide.